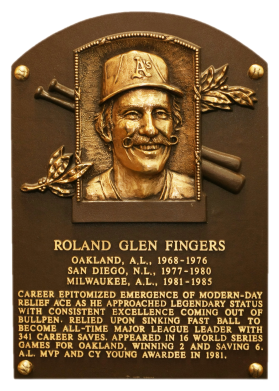 The earliest reliever to be used in a "closer" role, Rollie Fingers was the first pitcher to reach 300 saves. He was the fireman for the champion Athletics in the early 1970s, then led the NL in saves with San Diego. In 1981 with the Brewers, he won the MVP and Cy Young awards. Fingers retired in 1985 with 341 career saves. 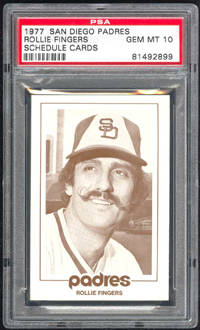 Comments: A 1977 O-Pee-Chee PSA 8 was my first portrait card of Rollie Fingers. I won the card on eBay in March, 2002. I replaced it with a 1977 Topps PSA 9 in May, 2003. 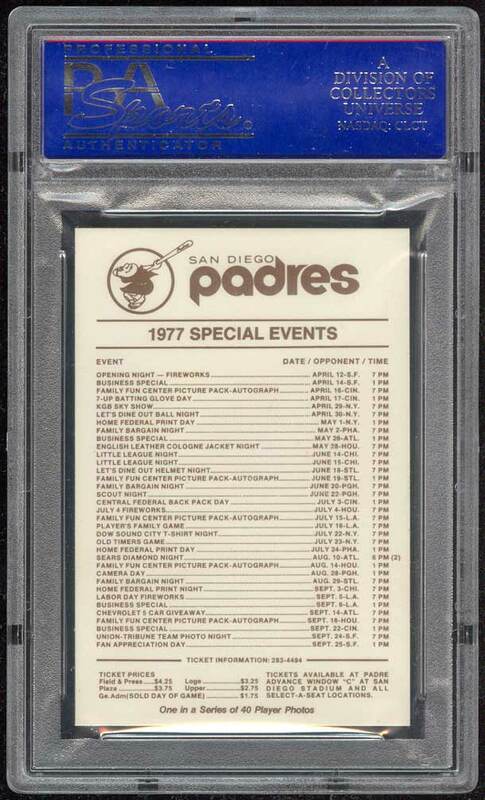 I already had a 1977 Topps Reggie Jackson card so I decided to replace the Fingers card with this 1977 Padres Schedule PSA 10 in May, 2006. 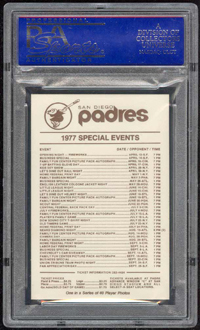 Description: Members of the 1977 San Diego Padres, players and management, are featured in this set. The 2-1/4" X 3-3/8" cards are printed in brown on thin white stock. Fronts have a player photo with a pinstripe around and the team and player name at bottom. Backs have the team logo at top, a list of promotional dates in the center and ticket information at bottom. While some card back state "One in a Series of 40 Player Photos," more than 80 variations are known, including some poses with blank backs.